Thursday, September 4, 8 B’aatz’, is the Maya New Year for the tzolkin, the Maya ceremonial calendar. 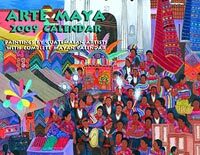 This calendar runs concurrently with the Maya solar calendar and this year falls on the 14th day of the month Mool in that calendar. The date of this Maya new year, pictured at right in the Maya glyphs, is 8 B’aatz’ 14 Mool. That particular date will not repeat again for 52 years in the Gregorian calendar. Of the more than one hundred Tz’utuhil painters, only four are women, and of the many more Kaqchikel artists, only a handful of them are women. 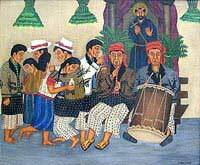 All of the Tz’utuhil women painters started off helping their artist husbands before they began doing their own paintings. It is more difficult for a woman to become an artist than a man, partly because of the initial investment of materials that is needed and partly because of the cultural attitudes. A year ago, while visiting Santiago Atitlan, I bought four delightful little watercolors that Elva Vasquez de Ramirez (photo, left, making tortillas) had done and one that her husband Nicolas Ramirez had painted. I requested them to paint me some more for me. When I returned, all of the new paintings were signed Ramirez. When I asked Nicolas why Elva’s signature was not on any, he said, “Oh, it doesn’t matter, we both work on them together.” Perhaps the only way to easily get around this attitude would be to explain that because of the interest in women’s art her paintings will sell more easily if she signs them herself. Paintings and biographies of the better Tz’utuhil and Kaqchikel women artists— Paula Nicho Cumes, Vicenta Puzul de Gonzalez, Maria Elena Curruchich, and Maria Teodora Mendez de Gonzalez—now appear in the Archives section. Works for sale by the women artists are in the Paintings section. The 2009 Arte Maya calendar in both English and Spanish. It includes photographs and biographies of the twelve Maya artists whose paintings appear in the calendar. The calendar includes four women artists—two Tz'utuhil and two Kaqchikel women. In addition to the normal Gregorian calendar, the 2009 Arte Maya calendar includes the complete Maya calendar with the day glyphs for both the tolkin (ceremonial calendar) and the haab (solar calendar). This is the eighth year of the calendar and the fourth year for the Maya glyphs. 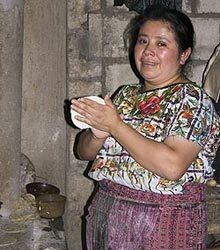 The Maya calendar is the same as the one used by the Maya priests in Guatemala today. The Arte Maya website now has a page in the Histories section explaining how the Maya calendar works. Most calendars are designed, printed and distributed by calendar companies. Designing the calendar are the interesting part for me, however, the distribution is difficult. I don’t have the connections that publishers do for distribution. I do well in the San Francisco Bay Area, but not in other areas with large Latino populations such as Arizona, New Mexico, Texas and Florida. If you know of any groups or stores with a Guatemala or Maya connection, I would greatly appreciate contact information. Heather Riley, a humanities teacher at San Diego’s High Tech Middle School had attended Casa Rosario Spanish School in Guatemala and was inspired by the Virma program at the school. 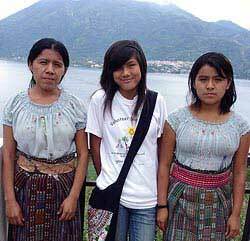 Virma pays for the schooling of Maya children who would drop out of grade/high school because they could not afford the modest cost. Heather and her seventh grade class wrote and published a book about the Maya to raise money to sponsor students in this program. So far the book has raised an astonishing $1600. The money raised is paying for the schooling of six Maya children for a year. The book, illustrated with drawings by the seventh grade students, is an alphabet book about the Maya of Guatemala. The book, M is for Maya, is published and distributed by Lulu, one of the new services that publish books on demand, one copy at a time, and sell them through the web. Katy Vaccaro of Heather Riley’s students visited San Pedro in July. In the photo on the left she is presenting a copy of the book to Vicente Cumes, director of Casa Rosario Spanish School and administrator of the program in Guatemala. On the right she meets two sisters, Catarina Yac Petzey and Elena Yac Petzey, who are among those being sponsored by her class. If you wish to see photographs of some of the twenty-six students currently being sponsored by this program or if you wish to sponsor one yourself (about $20 a month) go to the sponsorship page of the Casa Rosario Spanish school website. Under this program 100% of your money goes to help the students (Arte Maya and Casa Rosario cover any operating expenses). Juan Sisay was the second Tz’utuhil Maya painter (after Rafael Gonzalez y Gonzalez of San Pedro la Laguna) and the first Maya painter from Santiago Atitlan. Through ability and luck he became the darling of the international set in Guatemala. 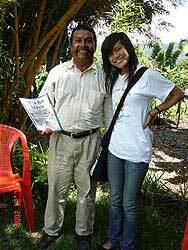 I arranged to meet him one year, but put it off because my time was too short in Guatemala. He was assassinated shortly thereafter. Over the years people have sent me images of paintings they bought from him. I recently posted many of them on the Juan Sisay page in the Archives section. This is the most extensive (virtual or real) collection of his paintings that is publically available. Starting September 25 Traje de la Vida: Maya Textiles of Guatemala will open at the Hearst Anthopology Museum on the UC Berkeley campus. 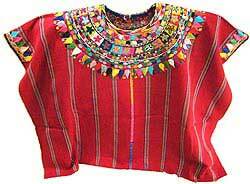 Curated by Margot Blum Schevill, Traje de la Vida explores the story of the Maya from the highlands of Guatemala. Through their weaving, they tell a narrative of culture, personal identity and of social and political transformation, with themes illustrating the resilience of the Maya people and the ability to tell their stories. Film footage by videographer Kathleen Mossman Vitale of Endangered Threads Documentaries is featured in the exhibition as well as photography by renowned documentarian, Jeffery Foxx. 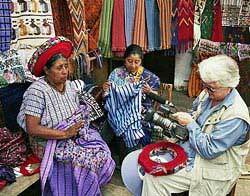 A Century of Color: Maya Weaving and Textiles, with the filmmaker, Kathleen Mossman Vitale. This production, rich in the colors and textures of Mayan textile traditions, explores the changes wrought by time and history. Beginning with examples from the 1902 Gustavus Eisen Collection at the Phoebe Hearst Museum of Anthropology in Berkeley, we follow the unbroken thread to the hands of today’s weavers. The film will be shown Saturday, September 13, at 10 a.m. For more information visit the deYoung website.